Halifax head coach Richard Marshall couldn’t hide his delight following his side’s 46-22 victory over London Broncos at Keighley on Saturday evening. Eight tries and seven goals saw ‘Fax beat one of their main rivals in the race to finish in the Kingstone Press Championship’s top four. “We played at a really consistent level today. “I don’t think it was our best performance of the season, but especially in the first half playing up the hill against a full time London side, we were really pleased,” he added. Marshall’s men got off to the worst possible start, falling behind to a Rhys Williams score inside the first minute, but hit back with five tries in a glittering first half performance. “It was disappointing to concede so early but we are never going to be faultless. Following the interval the Broncos scored two early tries to cut the deficit to 16 points. However, the men in blue and white pulled away towards the last quarter with tries from Ross Divorty and Mitch Cahalane. “The last quarter was pleasing in terms of both our skill levels and our fitness levels to pull away again and seal the victory,” said Marshall. 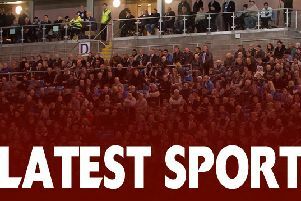 Dane Manning got ‘Fax on the board after Scott Murrell’s kick into the corner had been palmed down by Tyrer and Marshall said his side needed to play more to their strengths. “We know where we are strong across the field. “We have Steve Tyrer who is a class player and has very good ability at catching the ball behind his head in the air. A key battle identified pre-game by Marshall was in the halves and Scott Murrell and Ben Johnston won the arm wrestle, with the former Castleford junior excelling all evening. “We’ve needed some support for Scott as he’s not fully fit at the moment. “Jonno really put his hand up today and despite not being the biggest he’s defiantly got one of the biggest hearts in the team. ‘Fax return to The Shay next weekend when they host third place Sheffield Eagles hoping to avenge their earlier loss to the South Yorkshire side:. “That was probably our worst performance of the season,” Marshall added.